Reduced real estate investment has been the key reason for the strong decline of China’s solar thermal market. In 2015, the collector area installed annually was down to 43.5 million m2 (30.5 GWth), which almost put the figure back to the level of 2009, and the growth rates in 2013/2014 and 2014/2015 were -18 % and -17 % respectively. 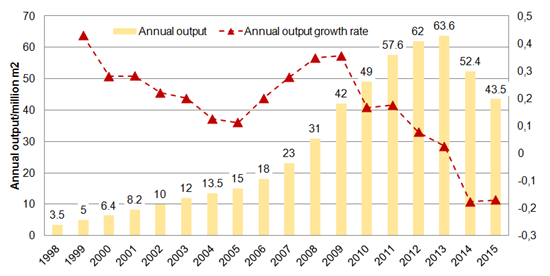 The chart on annual output was taken from a presentation by He Tao, Professor at the China Academy of Building Research. He held it during the Executive Committee Meeting of the IEA Solar Heating and Cooling Programme in Spain at the beginning of June. When presenting the numbers, the professor also emphasised that the industry “has made great efforts to find new applications for space heating, solar process heat and space cooling”. The growth rate of real estate investment showed a rapid decline from 19.8 % in January 2014 to 1 % in December 2015 (see the table below). Consultancy Germany Trade and Invest (GTAI) has forecast the decline to continue in 2016 and 2017. The building boom in recent years has resulted in a considerable number of vacant flats and homes mainly in medium-sized cities. Accounting for almost 22 % of the gross domestic product (GDP), the construction industry has been the motor of China’s overall economic growth over the last years, as GTAI emphasised in a publication from January 2015. The second reason for the downturn in the solar thermal market is the lack of support policies by the government, Tao said. The government supports the increasing mitigation of PV and wind power, but ended the support programme for rural households to purchase solar water heaters VAT-free and halted the solar city programme, which had encouraged municipalities to set solar thermal targets. Tao said that nothing had changed even after issuing the draft Thirteenth Five-Year Plan for Solar Applications, which announced an ambitious target of 800 million m2 of collector area (560 GWth) by 2020. At the end of 2014, China had around 414 million m2 (290 GWth) in operation. The Solar Five-Year plan has not yet been publicly available, but was sent earlier this year as a paper version to selected stakeholders for comments. In his presentation, the professor also identified the great solar space heating opportunities for round about 400 million people in China. Currently, the Yangtze River (see the red line in the chart above) is considered the border between the colder northern parts with heating devices in residential housing and the southern part of China, where space heating facilities have not been available. 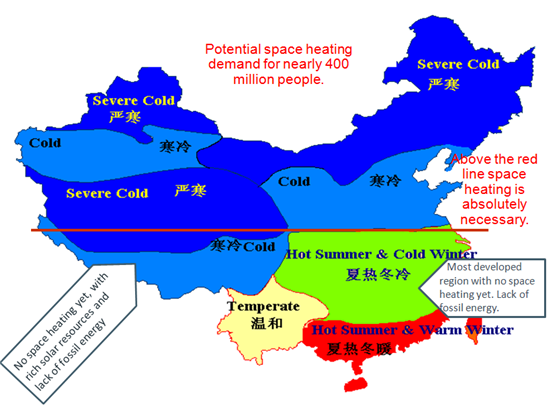 But times are changing: Demand for space heating is growing in remote areas, such as Tibet and the northwest plateau, but also in the most developed coastal region, across which hot summers are followed by cold winters (green area). These regions south of the Yangtze River have abundant irradiation, whereas fossil fuels are absent and expensive. He Tao concluded that “smog has become a barrier for China´s development.” To avoid coal-fired furnaces for space heating in rural areas – the main source for smog in several provinces, such as Beijing, Hebei and Tianjin – the country has seen the implementation of renewable building policies which stipulate the use of solar thermal or heat pumps for space heating in newbuilds and during major renovation.